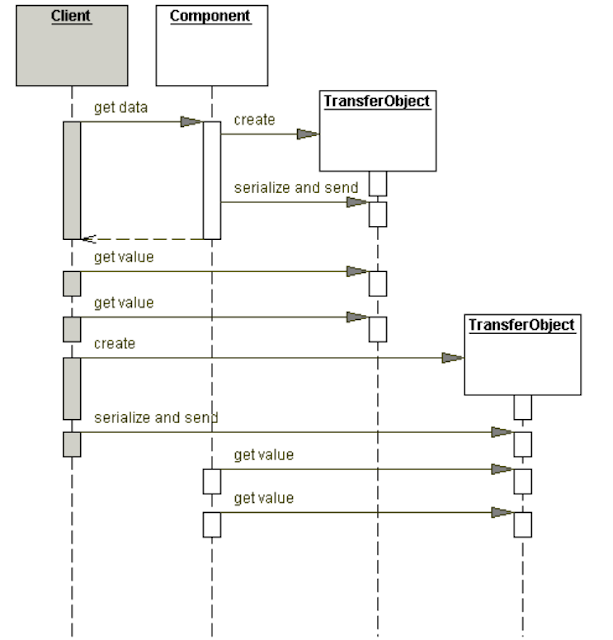 Data Transfer Object Design Pattern is a frequently used a design pattern. It is basically used to pass data with multiple attributes in one shot from client to server, to avoid multiple calls to a remote server. Pass data with multiple attributes in one shot from client to server, to avoid multiple calls to remote server. You want to transfer multiple data elements over a tier. You want clients to access components in other tiers to retrieve and update data. You want to reduce remote requests across the network. You want to avoid network performance degradation caused by chattier applications that have high network traffic. Use a Transfer Object to carry multiple data elements across a tier. The Data Transfer Object pattern is a design pattern in which a data transfer object is used to serve related information together to avoid multiple calls for each piece of information. Transfer Object is a simple POJO class having getter/setter methods and is serializable so that it can be transferred over the network. It does not have any behavior. Server Side business class normally fetches data from the database and fills the POJO and send it to the client or pass it by value. For the client, transfer object is read-only. Client can create its own transfer object and pass it to a server to update values in a database in one shot. A data transfer object is an object that carries data between processes. The motivation for its use is that communication between processes is usually done resorting to remote interfaces (e.g., web services), where each call is an expensive operation. [Because the majority of the cost of each call is related to the round-trip time between the client and the server, one way of reducing the number of calls is to use an object (the DTO) that aggregates the data that would have been transferred by the several calls, but that is served by one call only. 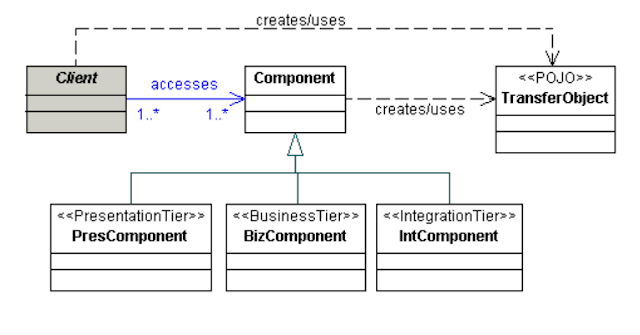 Below is the class and sequence diagram representing the relationships for the Data Transfer Object Design Pattern . Step 1: CustomerDto is a data transfer object POJO. Instead of sending individual information to the client. We can send related information together in a single POJO class. Note that DTO will not have any business logic in it. Step 2: Create a resource class which serves customer information. This class act as a server in the demo. Which has all customer details? * @param customers initialize resource with existing customers. Act as database. * @return : all customers in list. * @param customer save new customer to list. Step 3 : CustomerClientApp class is customer details consumer i.e. client to request for customer details to server. CustomerResource act as a server to serve customer information. The CustomerDto is data transfer object to share customer information. * Method as act client and request to server for details. * @param args program argument. The source code of this pattern is available on GitHub. Increases complexity due to synchronization and version control. The client is asking for multiple information. And the information is related. When you want to boost the performance to get resources. You want reduced number of remote calls.